The success of this publication is made possible through ongoing support of participating partners as well as private landowners, hunters, anglers and trappers, whose donations and funding directly support our work. See who Alberta’s conservation champions are. Each Conservation Site in the Guide identifies the partners who were involved in the conservation of this habitat. Conservation partners such as Alberta Fish & Game Association (AFGA) and its affiliated clubs as well as Ducks Unlimited Canada (DUC) contributed a large number of the Conservation Sites in the Guide. Their involvement makes this one of the most extensive outdoor guides around. As partners within the North American Waterfowl Management Plan, DUC receives funding from the North American Wetlands Conservation Act (NAWCA). These grants are supported by the U.S. government and assist DUC in long-term protection of wetlands and associated upland habitats needed by waterfowl, other migratory birds and wildlife in North America. Thank you to our advertisers, those who have stood by us from the inaugural edition and those who are supporting us for the first time. We gratefully acknowledge the hundreds of licensed hunting and fishing retailers in Alberta who distribute the majority of copies. Poaching is a serious crime with severe penalties. If convicted, poachers may be fined up to $100,000 and/or be sentenced to six months in jail. See a fish or wildlife crime or have tip? Make the call 24/7. 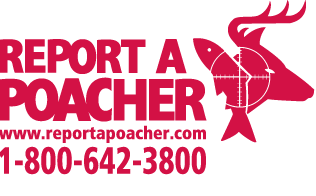 Alberta Fish and Wildlife Enforcement Officers are responsible for enforcement of the hunting and fishing regulations and Report A Poacher calls.